Iraq War Deepens Sunni-Shia Divide When the United States invaded Iraq four years ago, it didn't set out to deepen the Sunni-Shia divide in the Islamic world. But that may be one of the most important outcomes of the war. 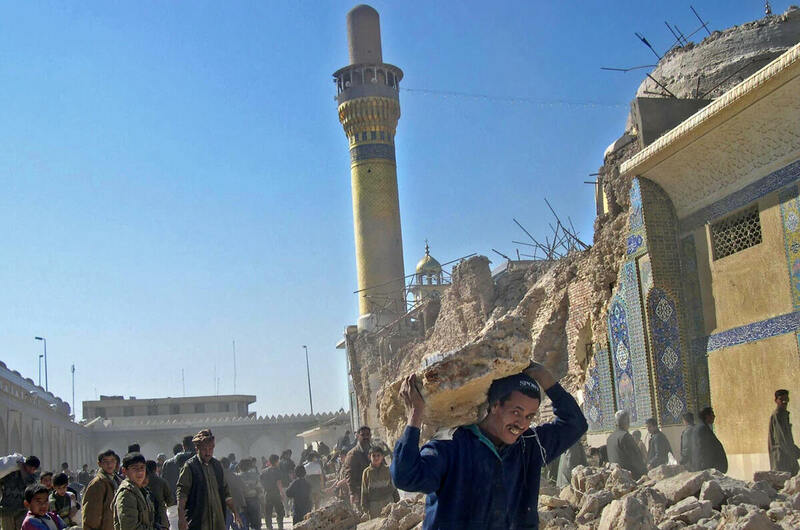 The February 2006 bombing of the Askariya Shrine in Samarra, a mosque linked closely to historical imams of Shiism, sparked an onslaught of Shia on Sunni violence. When the United States invaded Iraq four years ago, on March 20, 2003, it didn't set out to deepen the Sunni-Shia divide in the Islamic world. But that may be one of the most important outcomes of the war. American leaders told the nation and the world that the Iraqis would view the United States as liberators, not occupiers, that the war would be over quickly, and that Iraq would return to peace. Although he was born and raised in Iran, Iraq's senior cleric, Grand Ayatollah Ali al-Sistani, advocates a political future for Iraq that is far different from the Iranian model. Those rosy predictions did not take into account the frequently violent and tragic history of Iraq, especially the aspirations of Iraq's often brutalized Shiite majority, says Augustus Norton, professor of Middle East history at Boston University. "When proponents of the 2003 Iraq war would argue that the Shi'i Muslims of Iraq were predominantly secular in orientation, they either ignorantly or conveniently forgot about this recent history, which has had the effect of pushing the Iraqi Shi'is away from secularism, towards, if you will, higher levels of religious identification and religiosity," Norton says. So, it should not have been surprising that Iraqi Shiite clerics and Shiite political parties immediately seized the initiative, pressing for quick elections and a representative government. "For well over a century, Shiite clerics have led movements, advocating parliamentary rule and just governance in the Middle East," says Yitzhak Nakash, author of Reaching for Power: The Shi'a in the Modern Arab World. "In post-Baath Iraq, clerics have again taken the lead in large part because there is hardly any form of secular civil society in the country today that can act as the nucleus of an Iraqi political system." Until the overthrow of Saddam Hussein, the Shia never governed a modern Arab state. They were in control in Persian Iran, but the Sunnis led most Arab states in the Middle East. The change in Iraq was a shock. "The Shiites have an Arab Shiite champion," says Juan Cole, professor of Middle East history at the University of Michigan. "This is a new thing. Baghdad has emerged as a center of Arab Shiite power." But that is not without its consequences. The backlash among Sunni Arabs in Iraq quickly turned violent. The Sunni insurgency first targeted American troops, but soon, with the involvement of al-Qaida in Iraq, it attacked the Shia as well. The targets: Shiite holy sites; Shiite neighborhoods in Baghdad and elsewhere, and ordinary Shiite civilians, thousands of whom have been abducted and murdered. And then a year ago came the bombing of the Askariya Shrine, a mosque directly connected to the story of the Twelfth Shiite Imam, the messianic Hidden Imam. In 2006, the Shia fought back through militia attacks and murder. Shiite-Sunni violence now predominates in Iraq. "It went virtually off the scale with the attack on the mosque," says Wayne White, a former senior intelligence officer for the State Department. "Essentially a cycle of violence has been generated, initiated by al-Qaida in Iraq, which deliberately attacked Shia targets with suicide bombings in the expressed hope of provoking just this sort of confrontation. And they've succeeded all too well." The United States claimed that Iran was responsible for much of the violence in Iraq. There's no question that the Shiite government in Baghdad has a close relationship with Tehran. But Vali Nasr, author of The Shia Revival says that's far from the whole story. "It is not Iran that is right now a threat to the political power, to the livelihood, to the sense of security of Iraqi Shias. It's the war with their Sunni countrymen that is the main threat," he says. At the same time, top Shiite clerics in Iraq worked hard to pursue their own model of government, distinct from the Iranian rule of the mullahs. Iraq's senior cleric, Grand Ayatollah Ali al-Sistani, although born and raised in Iran, advocated a political future for Iraq that is far different from the Iranian model. "Ali Sistani does not see the Islamic Republic as implemented in Iran as at all appropriate for Iraq," Norton says. "Instead, he understands the role of clerics like himself as being outside the political system." Source: Reprinted from 'The Shia Revival' by Vali Nasr. Copyright (c) 2006 by Vali Nasr. 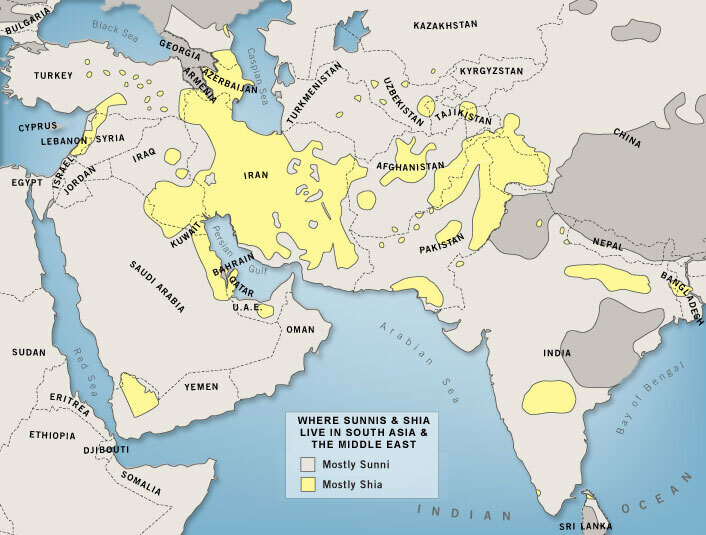 With permission of the publisher, W.W. Norton & Company, Inc.
Enlarge the map to see where Sunnis and Shia live in South Asia and the Middle East. Ayatollah Khomeini of Iran created the model of the Islamic republic with all power resting in the hands of the clerics. Although this has been the government of Iran for more than a quarter century, there are doubters — in Iran, Iraq and throughout the Shiite world. They are encouraged by Sistani's model, Nasr says. 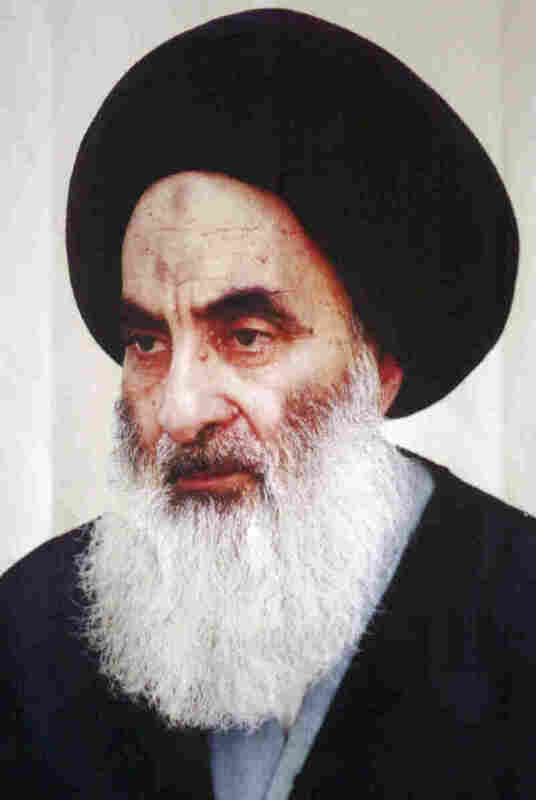 "The popularity that Ayatollah Sistani has in many places in the Shia world, including Iran, really underscores the fact that Khomeini's theory, although it became politically triumphant in Iran, is still facing theological difficulties within Shi'ism, because it runs against the grain of the entire Shia religious development," Nasr says. Still, not all of Iraq's Shia agree. Twice in 2004, street fighting broke out in Najaf, with the Shiite militia known as the Mahdi Army attacking American troops. Sistani mediated an end to that fighting, but since then this militia has spawned neighborhood defense forces as well as anti-Sunni death squads. It also catapulted its leader, the young firebrand cleric Muqtada al-Sadr, into a prominent role in the Iraqi government. Some in the United States claimed that he or other Shiite figures were surrogates for Iran. White, the former State Department intelligence officer, disagrees. "I think Iran is a secondary actor right now in Iraq," White says, "along with Syria and Saudi Arabia. The internal dynamic, the viciousness of the fighting on the ground, is very much being stoked up by communal problems inside Iraq itself." The escalating sectarian violence in Iraq has become a great concern for the Saudi monarchy, fearful that it may spread to the kingdom's own Shiite minority, which lives near some of the most valuable oil fields in eastern Saudi Arabia. The Saudis and other Sunni leaders became even more uneasy when war broke out last summer between Israel and Hezbollah, the Shiite militia in Lebanon. "For the first time, Arabs break rank in the middle of a fight against Israel," Nasr says. "A group of Sunni Arabs, jihadis as well as kings and presidents, adopt a sectarian posture towards Hezbollah." The Sunnis did not automatically support Hezbollah's actions against Israel because they feared it meant the strengthening of Shiite power and Iranian influence. In response to the chaos, the United States found itself siding overtly with Sunni leaders and nations, a position that Nakash challenges, based on the full record of Shiite politics in recent years. "The decrease in acts of violence by Shiites against Western targets since the mid-1990s has stood in contrast to the growth of Sunni-sponsored terrorism by al-Qaida and other militant groups, a strategy that all Shiite groups have condemned, including the Lebanese Hezbollah organization, the Sadr movement in Iraq, and the hard-line regime in Iran." History does not seem to be the preferred guide as the United States makes its way through the chaotic upheavals of the Middle East today.